After Donyall Dickey, the lone finalist to become the superintendent of Portland Public Schools, abruptly dropped out of the running last week, PPS is back on the market for a new school superintendent. Starting today, the Port of Portland commission will be interviewing the three finalists for the position of executive director. Current Executive Director Bill Wyatt will retire from the Port on June 30. A side note: Only 71 people commented on the finalists during the two-week public comment period that ended April 24th. Portland Business Alliance director Sandra McDonough will retire in 2018, and the board is searching for someone to replace her by the middle of next year. The state’s two largest business associations, Associated Oregon Industries and the Oregon Business Association, will officially merge July 1. 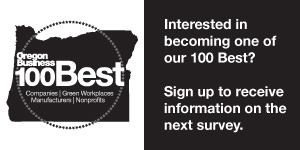 A leader for the new entity, to be called Oregon Business and Industry, has not been identified. Portland State University president Wim Wiewel is stepping down after eight years. Vice president of communications Chris Broderick says the Board of Trustees is negotiating with one of the finalists and hopes to wrap up the process next week. The university will vote to appoint the new president at a public meeting that will be posted a day ahead of time. Undoubtedly there are other prominent organizations and agencies with vacancies in the top ranks. But in a city that proudly touts its knowledge economy status, the baby boomer retirement exodus demographers have been predicting for years is about to hit us where it hurts: the business and education sectors. Portland’s largest school district and public university are about to get new leadership. (And I didn't mention the three positions for PPS school board, to be decided during next week’s special election.) So will the Port and the new Oregon Industry and Business group, an entity endowed with formidable lobbying power. How the changing of the guard will impact a city and state defined by education budget challenges, wars over business taxes and radically changing socio-economic demographics is unclear. The definition of leadership itself is in flux, as technological change accelerates, hierarchies flatten and ossified institutions either crumble or remake themselves. Incoming university presidents, superintendents and business association chiefs must create sustainable, transparent organizations that not only promote civic and economic well-being but also empower people to chart their own course in a city and state in the throes of transition.